The extended family of Venezuelan dictator Mr. Nicolas Maduro should by now be transferring all their accounts to Switzerland as this is the second warning of possible looming military intervention in a week. This time around, the Organisation of American States’ head, Mr. Luis Almagro claimed that, after visiting and speaking to Venezuelan refugees in Colombia (and meeting with President Ivan Duque), the international community should consider ‘all options’. His words come exactly one week after it was revealed that the Trump administration had held a meeting with disgruntled Venezuelan officers wanting support for a ‘coup’. The Secretary-General of the Organization of American States (OAS) Mr. Luis Almagro stated clearly that a "military intervention" to "overthrow" Nicolas Maduro's cannot be ruled out. Mr. Almagro made the remark whilst visiting the Colombian city of Cucuta (a border city that has borne the brunt of the Venezuelan refugee crisis fleeing to Colombia). In neighboring Brazil, violence at the border between resident Brazilians and fleeing Venezuelans is also causing a lot of problems. Related coverage: <a href="https://thegoldwater.com/news/36534-Revoluci-n-White-House-Discussed-Maduro-Coup-With-Venezuelan-Officers"> Revolución? - White House Discussed Maduro Coup With Venezuelan Officers</a>. The chief of the Washington-based OAS said that the regime of Mr. Maduro in Caracas was clearly committing "crimes against humanity" on its people and therefore "with regards to a military intervention aimed at overthrowing the regime of Nicolas Maduro, I think we should not exclude any option." "The international community is responsible and cannot allow the existence of dictatorship in Venezuela, a dictatorship that affects the stability of the entire region." 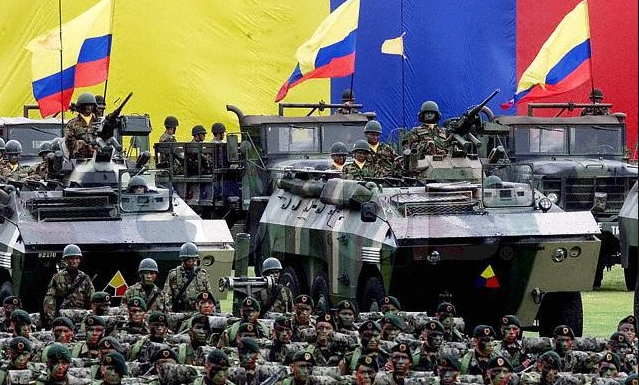 A military intervention in Venezuela, which many assume would be done by its neighbors Colombia and Brazil with US support, would be unprecedented. In the past 50 years, the South American region has not seen two nations wage a full-scale war against each other. It is to be expected that if Mr. Jair Bolsonaro, the right-wing conservative candidate of the Brazilian elections, would secure the presidency next month, then the risk of a military intervention to depose the Maduro regime by Brazil and Colombia would seriously increase. Mercenaries 2 before Mercenaries 1? What is this wizardry! ?